Locke Design & Woodworks has designed and built a number of custom cantorstands and musicstands to blend into the space they are intended. However, there is always a need for more musicstands to accomodate the various musicians and singers. This is ususally addressed with commercial black musicstands. While the commercial stands cannot be beat for price and utility, they add nothing to the enviornment. To fill this need Locke Design & Woodworks designed a musicstand using a commercial base. With an elegant, curved top which can be made of almost any wood to match any space these musicstands are available with a locking or a spring loaded base depending upon the client's preference. The top is lightweight, enabling the stands to retain the adjustability and portability of the ubiquitous metal stands. 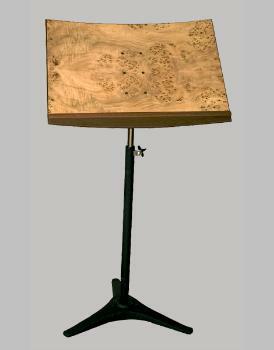 A small inventory of musicstands of various woods including oak, walnut and a selection of tops veneered with various burls is available for immediate shipment.. 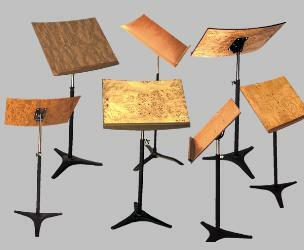 These musicstands are $325.00 in most of the common hardwoods and $350.00 for in stock burls. The price may increase if non-stocked veneers are requested. Please call or email info@lockedesign.net for availability and pricing for specific woods and finishes or to place an order.. A 10% discount applies to orders of 3 or more musicstands. Musicstands can also be ordered with flat wood tops which can have a logo or text carved into the surface. These musicstands perform well for chamber music groups and other musicians who can have matching, elegant and distinctive musicstands.